Gotcha. Wonder if this casing would cause any lagging in responsiveness? Won't know for awhile, but if Davis wants to get away from how they encapsulate on board (maybe damaging sensor) they should look into a waterproof design like this. This is how the probe sensors are designed in elongated tube fashion with waterproof enclosure. So we are just replicating that design with these. Gotcha. Probably order one myself soon. I put the SF2 on my 31 about a week ago and have seen no difference. I would think the SF1 is similar. I'm honestly not sure if this was shown here before, but I'm going to see if I can buy this directly from Sensirion (I got my 15 directly from them) without having to buy 10,000, and see if my stereo buddy down the street can work his magic again installing it. Thanks for the link. Yes, that's my point, you get the sensor and the cover and Davis has nothing to do with it. I can only hope that digi-key's handling process is as Sensirion dictates. Now, can my guru get it mounted to my existing board?? Are we sure these work with Davis ISS? I was under impression Davis had special protocol it's digital LLC. This is waaaay over my pay grade, but all I see is SHT31 and i2c thinking this is compatible. Merely an assumption. I2c is not for sure. Like I said... If no one else can give an absolute whether this will work or not, I'll be calling digi key tomorrow for their input, they may be clueless too. Sure would be nice if it was, at least it would be another option to try. Valentine Weather, several hundred posts ago, thought we had exhausted the points in this thread and should wait for a response from Davis. Well, I think this thread continues with great thought, but has anybody heard from Davis on the SHT31 issue? As an aside, despite our problems with Davis, I am amazed at the VP2 product line. Today, I was installing a separate transmitter for my anemometer (part no. 6332) as I only get one decent wind reading from my 3 VP2s, so I consolidated to use only the one decent one. So I have used 4 of the available stations! Maybe a neighbor will take the remaining 4 transmitting stations? Considering the VP2 product line is now about 15 years old, I am amazed how it has stood the test of time with a few glitches along the way, including the SHT31. If Apple bought out Davis we'd have a new VP every year. Yeah and the price would double! Yeah and it would look cool just like a Netatmo, as it would have been designed for looks first and function second...."You are putting it outside in the sun wrong!" IMHO, there's no way that Davis will respond to this issue within the VP2's production lifetime. We (this forum) are a TINY portion of their sales and the other 99% are oblivious, just as we were until recent. Too much time, R&D is needed to address this issue properly to the satisfaction of us and Davis (read money). Honestly, I only see a resolution when a new model is released, and that's only IF Davis thinks it's a problem in the first place, which I'm dubious. Unfortunately, CW2274, I think you are right. But if this SHT31 issue becomes the impetus for the long awaited VP3 or whatever Davis calls it, so be it. I will just have to update my equipment—unlike my cellphone—I still use an iPhone 5S! How embarrassing! Okay here goes nothing.....[deep sigh...anticipating backlash]... I was wondering if anyone of you dealing with this VP2 humidity sensor issue, and with the financial means, to spend some money for more testing hardware for the sake of knowledge. My proposal is to use the the newest Ambient Weather WS-2902A weather station as a comparison. Surely I'm not suggesting replacing a VP2 for a WS-2902A. But being an owner of a WS-2902A I have been thoroughly impressed. I've wanted a VP2 for quite some time. And I'm affected by this issue because I still think I will eventually get a VP2 or whatever comes next. So finding a resolve for this issue with Davis is important to me. But you know what?...My neighbor replaced his 2006 VP2 for a WS-2902A just last month. I've been meaning to introduce myself and ask him why. I know on paper the VP2 should have better sensors that are more precise with less deviation percentage specifications. And there are many many things far superior on the VP2 like separate anemometer/wind vane, FARS option, faster console refresh, PC software connectivity, and add-on sensors (soil, leaf...etc..etc). But I'm just curious how good the WS-2902A humidity sensor is. I suppose another option is to compare an existing VP2 to a nearby WS-2902. But I haven't found a good example yet. Most WS-2902's are poorly sited, and you would need to have intimate knowledge of the VP2 being compared if it had a SHT31 or SHT15 or if it was modified to SHT75 and how old that sensor is. So this means it isn't something I can do myself. But someone with an VP2 could compare to a nearby WS-2902 or they could buy their own WS-2902A to do some testing. Why am I proposing this test? - Because I own a WS-2902A and it seems to be a popular choice with much sales growth compared to all else, at least in the PWS market and those that connect to WU. I know this shouldn't be the only indicator as I'm sure there are tons of VP2s that don't connect to WU. - No one knows what sensor is in the WS-2902A and it might be an indication of something new that is really good and maybe better than anything we have seen before. I haven't taken mine apart but I'm tempted. But don't want to void my warranty. Why do I believe the WS-2902A humidity sensor is so good. - I've seen it report consistently humidity levels of 95, 96, 97, 98, and 99. (it never hits 100). - Seems to be accurate in the mid range compared to airport here in Florida humid Summer weather. - Most WS-2902 devices I find on WU seem to all have really nice data. Consistent graphs. Lots of data points and no gaps and quick response. - Most WS-2902 that are nearby all match up perfectly. So what could we gain from this and how does it help with the VP2 issue? - Determine if the WS-2902A is any good in dealing with humidity. You all have compared your sensors to Vaisala, or Rainwise....why not look at another cheap option that may be really good and seemingly ignored solely because it seems cheap. - Find out what sensor is in the WS-2902A and if it is any good. - If this is good stuff we could hope that Davis employs the use of the WS-2902A sensor as a future upgrade. - If this is good stuff and made available for Davis, it will be cheap as the WS-2902A is cheap. - The radiation shield is little and I've notice a degree maybe two sometimes spike on intense sunlight days. - You can connect it to a Meteobridge if you also get an ObserverIP device. In fact it may be cheaper to get a separate ObserverIP and just the outdoor array module and forget the display console. It isn't sold this way but you can get just those two parts and have a fully functioning station. - The WS-2902 is the prior version. They change the name to WS-2902A when a new firmware was introduced to change the WiFi setup method. But a WS-2902 can be converted into a WS-2902A by just upgrading firmware. I may seem use the two terms interchangeably but I'm not. I say WS-2902 when talking generic and regarding established base or WS-2902A when referring to a new purchase or a known specific device running newest firmware. - WU just shows both WS-2902A and WS-2902 as just WS-2902. - WS-2902A hit #1 in sales group on Amazon a few weeks back and is currently at #3 or #4. Hope you guys are wrong...Myself I think we could see a design change in sensor with a encapsulated probe, similar to higher end sensors instead of molding sensor into board for water resistance. I've said several times the SHT31 in the acurite's work fine. Still reach 98% but doesn't show the high bias so it's either the LS version Davis uses or the process of embedding with plastic onto board. Hopefully they are currently testing this theory out among others they may have. The email said give the engineers time to get this figured out. Before any major change they need to make sure and this takes time. Just because it's popular sure as hell doesn't make it good. For me personally, I would never go downhill on my PWS, bad humidity 31 or not. I wonder how many WS's I would have needed to replace in the 11 years I've had my lone VP2 in this Arizona sun. Phftt, forget everything else in the VP2's favor, that's gravy. Exactly why I have no comment on what stations are most popular on WU. Really don't care about popularity usually just the opposite. I would own one of those throwaway Iphones with the masses and need to replace every other year if it survives without being fully armored. Meanwhile my 5 year old Note2 doesn't have a scratch on the glass lives in my pocket with keys, change with no protection (zero) been through multiple drops and survived, saves me money every year because it may be the last phone I'll ever need. Just had to comment, bad things about vp2 is probably super cap, which usually is years down the road and probably happens long after most cheap stations have been replaced. The sensor issue is new and not as big a deal as replacing a cheap station. Why i have and will have vp2, nearly a year ago Harvey blew in here as a cat 4 storm and i had 8 inch tree limbs as well as whole trees blown down, carport blew over the garage roof, radio tower down power poles snapped off, etc. my vp2 worked all the time on battery and the anny had a wind run of nearly 22,000 miles and is still working today and iss never missed a beat. Outdoor tough is worth a lot and i am willing to put up with a few problems that can be solved with a new sensor or capacitor. Just my thoughts. 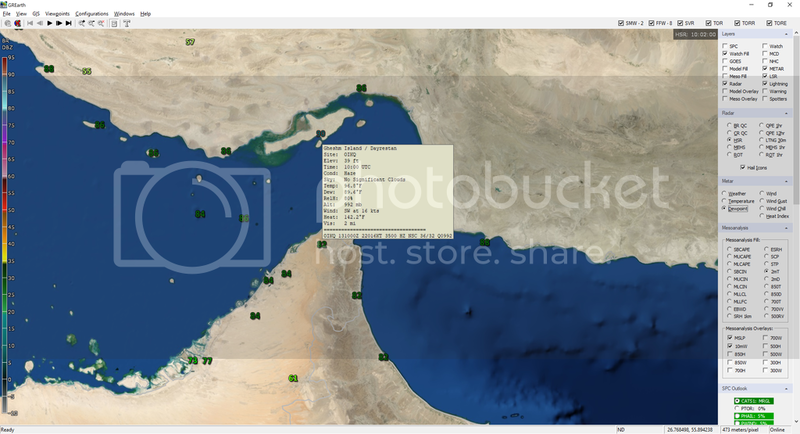 Obs from the Persian Gulf. A little off topic I know but I seriously wonder if there are any Davis VP2s around here and how they compare to official obs. I just cant imagine a dew point in the 90's with a HI of 140! My old boss who was a Weather Officer with the Navy back in the 70's used to tell me about the insane inversions they get there and how it made tacking aircraft with radar very difficult.